Nowadays, Paytm is becoming increasingly popular especially in the current situation of demonetization. Paytm begins its journey with online recharge portal that allowed people to recharge online. Later on, witnessing the increasing competition, Paytm started shopping business like that of Amazon, Flipkart etc. Today, Paytm is one of the largest mobile wallet that helps customers with operations like recharge, booking tickets, shopping with amazing deals and many more things. The reason behind its popularity is the availability of different services under a single platform. As Paytm is going to register itself as one of the largest media of currency exchange in future years, app development companies are striving hard to develop a best-customized app like Paytm. But the question is, how much would it cost to develop mobile wallet app like Paytm? 1. API development that communicates between your service providers and users. 2. Development of mobile application. 3. Tie-ups will deal, offers and discount providing brands. Firstly, to create an API, you need to get in touch with respective service providers like Vodafone, Airtel, Idea and much more. They will provide you payment related API's if they have. After having API, you need developers to develop an interface that connects application and API. You also need to integrate payment gateway within your app. Well, contacting multiple operators and integrating all those API is quite a tedious operation. Instead, you can partner with app development company - Hyperlink Infosystem that highly experienced in the development of an m-wallet app to carry out that hassle free transaction between various entities. However, the cost of app development varies as per platform. 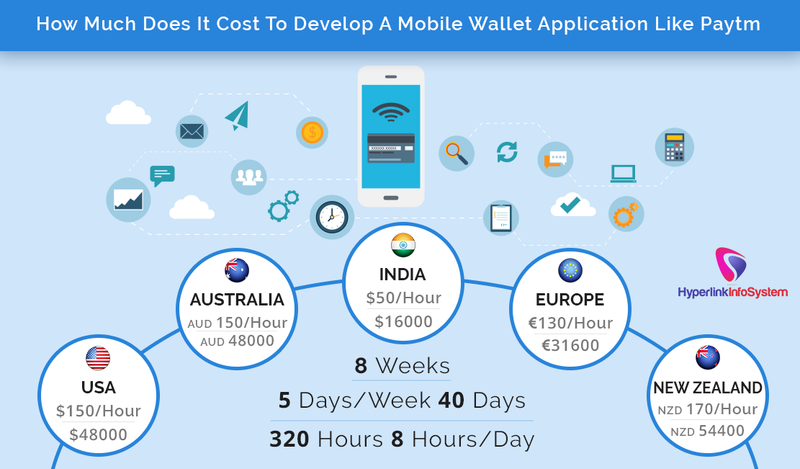 Average cost to develop such app on both the platforms is approx $16,000 at $50 per hour. Cost may fluctuate as per features and app development complexities. Contact us now to get a quick quote with the best rates for your requirements.